First floor apartment, one bedroom, one bunk room. Large kitchen/diner and lounge. Great views of Ressachaux and Nyon, and Nantua. Windows in every room including the bathroom. 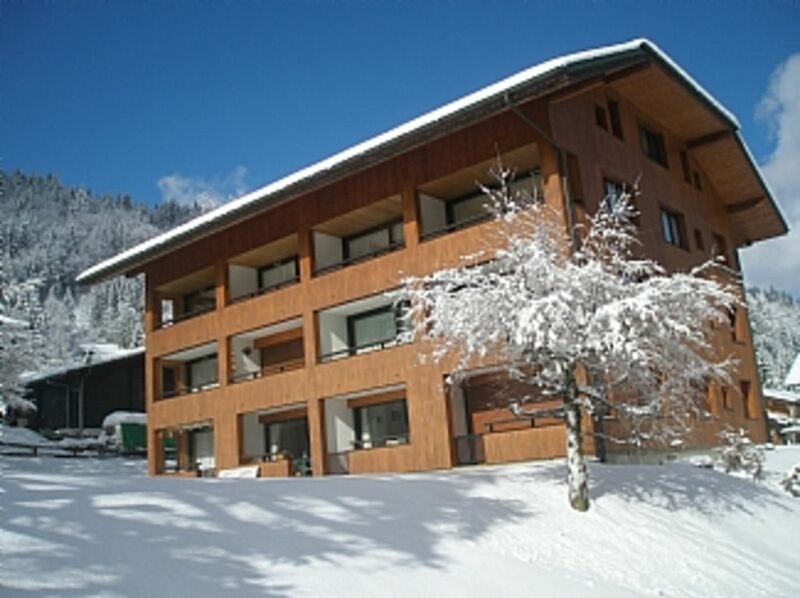 Equidistant from from Pleney lift (6 mins walking) and Supermorzine lift (5 mins walking). Located next door to the Hotel Fleur Des Neiges. Entry to building by coded security system. Only nine apartments in the Block. A real home away from home, with better views. Please note there is a minimum of 4 nights when booking. I am a keen skier, mountain hiker and cook, I also love a game of cards, I am a member of the Morzine Bridge club. I live in Northamptonshire, England with my two children. I teach Food Tech, play tennis and a member of the Weston Wobblers, we cycle our road bikes every Saturday morning. I take both my bike and tennis racket to Morzine in the summer, its wonderful! A real home from home, very comfortable with well appointed kitchen, but you have fabulous restaurants on your door step and up the mountains, foodies heaven! The View doesn't get better, and the location is so central, there's no need for a car or bus here in the winter. I do recommend a car in the summer to explore the area. Recently renovated bathroom with bath/shower. Kitchen with cooker/hob, fridge, washing machine. In the heart of the Portes du Soleil. Thank you! Hope you will visit again one day. Very clean, bright and tidy apartment located about 10 mins walk from the centre of Morzine, equal distance between Super-Morzine and Pleny bubble cars. About 3 minutes walk to the supermarket. We were 4 adults staying 6 days and did find it easier for one of us to sleep on the sofa bed in the lounge rather than two in the bunk bed room (not so much room for suit cases) but that was really not a problem as the lounge is very spacious. Excellent communication with Angela before and during the week with a super response time (minutes!) for a few queries and questions we had. Easy to use Sonos music system speaker and powerful fast WiFi. A very positive and trouble free stay, making for an excellent snowboarding holiday in Morzine. Would definitely stay again next time we're that way! Beautiful dual aspect apartment with fantastic views of the surrounding mountains including Point du Nyon. It's in an ideal location in the town centre of Morzine, being close to all of shops, bars and restaurants, yet being in a very quiet side street. Also it's very close to the local Casino supermarket so it's easy to stock up on provisions. There's plenty of ski hire options nearby, but our personal favourite is the Intersport next to the Super Morzine bubble, where you can leave your skis and boots overnight to save any treks across town lugging gear. Back to the apartment, Angela the owner was very friendly and helpful when we spoke, and all of the check in information was clear and easy to understand. Would love to stay here again. The flat was in good proximity to the slope, centre and grocery shop, warm with a well equipped kitchen. We enjoyed our stay. The apartment was very spacious and clean. The living area was lovely with fabulous views of the mountains. I stayed here on a 3 night break with 3 girlfriends. It was perfect for us and I wouldn't hesitate to go back next year as not many places were keen to let us stay for just 3 nights. 1hr 15 mins from Geneva Airport. Booking Notes: Please contact owner. Changeover Day: Changeover day is flexible. Notes on prices: Contact owner for out of season and short break prices.